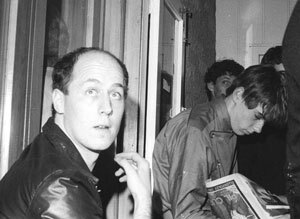 A lifetime ago, in very early 1977, when a few of decided to dip our toes into the just bubbling punk thing we were reading about in our three month old NMEs it seemed like a fairly slight thing to do, a thing without any momentous import. With Brett Salter and Bill Pendergrast I formed The Suburban Reptiles for no other reason beyond the idea that it sounded like a fun thing to do, and it raised a finger to the dross that was coming out of the bars and clubs. Across town The 1B Darlings, an ATI band playing lots of r'n'b and glam covers mutated into the more punk, The Scavengers, about the same time and I guess for the same reasons. We soon became a fairly close knit grouping of mates. Over the next few years the thing we started took on a life of it's own and dozens, maybe hundreds, of bands were formed in the style of the genre and it's mutated offspring, post punk, and the more brutal oi! But even when, ZM Dj, Bryan Staff formed Ripper Records, and AK79 was released at the end of 1979 (but in real terms early in 1980) it was still just a thing of it's time, We all loved it for that, despite the fact that we knew then that that time was passing, but I'm thinking Bryan saw the run of 500 as covering the demand. Eventually, hooking up with CBS he sold many times that number but by the time it was deleted in 1983 we all thought it had run it's course. By 1993 when I put together the extended version it was obvious it's legacy went beyond the initial release. It had become more than an album, it had become the definitive document of an era which had, without question, kick started the explosion of New Zealand music, both on record and live to the place it was then, and even more so now. Bryan's album has become the most important New Zealand release of the past forty years. Without it, no indie labels, no live explosion of the 80s onwards, no creative splurge. It was the record that began the New Zealand recording industry as we know it now. So, when I decided on a re-release it was essential to do it justice and not only did I carefully remaster the original, but I extended it from 10 tracks to 26 to cover every important NZ recording of the era. I'm happy with the result and it's gone around the world in this form. So, in 2008, almost 32 years after it all began in Auckland, in The Scavengers' practice room in Customs St and the basement of a house in Ponsonby Terrace where the earliest Suburban Reptiles noise was made, John Baker, after a huge amount of work has managed to put together quite a lineup of bands, including a version of The Scavengers, Proud Scum, The Spelling Mistakes, The Features, and The Terrorways, (the links before I'm pulled up are from an article I wrote in 1980 and not updated at all from then, but I though oddly appropriate since we're looking back) three of whom haven't played since 1981. It's at the Montecristo Room on November 22..and around the same time the unreleased Features album we recorded for Propeller in late 1980 will also get it's debut release. I'm not going to be there as geography precludes it, but the thought of missing the faces I know are going to be there (but not the almighty hangover that is a given) is making me a bit misty eyed. But that's tempered with the fact that I'm still pretty close to so many people from that era, many I talk to on a daily basis. We were a gang, and there was something about just being there. The bottom image is a postcard, drawn by Johnny Volume / Scavenger and sent to me in 1978..I don't think it's appeared anywhere before. At the time of writing McCain is sitting 10 points ahead of Obama in one national poll in the US (he’s also ahead in couple of others including Zogby, who are notoriously, and dismissably unreliable but Gallup are the first serious pollster to give McCain this sort of lead). It’s a hell of a ‘convention’ bounce and it’s easy for the Democrats to write it off, but they should be very, very worried. Right now you can almost feel the shockwaves. Clearly the messages and images from the RNC worked extraordinarily well, and the Democrats played perfectly into their Rovian hands by swooping on to the VP choice and missing the targets that might really matter (that is, after all, what she’s there for..to divert the gaze from the issues that might really matter or hurt McCain). After all, corrupt or not, experienced or not, pregnant or not, she's hot! And clearly America loves big parts of Sarah Palin. Forget the fact that she’s a born again wacko who may or may not have breached a few ethics rules as mayor of where-ever, Alaska, and filled her speech full of half truths, and blatant lies. Forget all that...they love her. Like John McCain, her speech (sermon?) was little more than a series of simplistic rabble rousing slogans and right wing platitudes that stand up to little scrutiny. And the flag waving: Ewessay! Ewessay! Ewessay chanters bought it, as does the mass out there watching, it seems. But the key thing to remember about Sarah is none of that…it’s the fact that her speech was written by one of President Bush’s speechwriters, Matthew Scully. And not only that it was written, mostly, prior to her anointment as the new Mother Teresa of the right. That’s right, she’s a calculated allegedly pretty vacuum there to repeat the simple memes for the troops. And deflect the arrows from the boss. The Republican's ties to President Bush remains a huge vulnerability. In the poll, 63% say they are concerned he would pursue policies too similar to those of the current president. Bush's approval rating is 33%. But instead of attacking that very obvious, potentially election winning, vulnerability over and over again, Dem Central goes into a muliti-day overdrive about Sarah’s church and her banning of books and a thousand other irrelevancies that just turn people towards her. And some positively gruesome stuff from Kos. Rove knows that just about nobody cares about those things…or at least if they do they are already confirmed Obama voters. For the rest, the message is Ewessay! Ewessay! Ewessay! And she's hot. Which is all that matters. This is the nation that thinks it invented democracy and can’t in gods name see why anyone else in the world doesn’t want to be just like it. Ewessay! Ewessay! Ewessay! McCain takin' it to the ruskies, the krauts and whoever else tries it on, with a babe at his side! If you want that any clearer, wander through the positively stone-age comments on that USA Today story. This is, BTW, the biggest selling newspaper in America. And that’s it…how nice..how polite..the toughest things said about the woman came from these guys! And right now nobody is mentioning McBush. "In the Senate, John[McCain] has voted with President Bush 95 percent. And that is very hard to believe." The Democratic vice-presidential candidate is exaggerating McCain's support for the policies of President Bush. According to the Congressional Quarterly, which keeps score, McCain supported the Bush administration on 95 per cent of the votes in 2007. But his loyalty score for the first seven and a half years of the Bush presidency is significantly lower--90 per cent. But the idea that Americans instinctively recoil from negativity or that there will be some sort of backlash against Republicans generally and Palin specifically because of how "negative" their convention speeches were is pure fantasy. Cultural tribalism and personality attacks of those sort work, especially when they're not aggressively engaged. Every four years, the GOP unleashes unrestrained personality attacks on Democrats and exploits cultural resentments. Every four years, Democrats tell themselves that such attacks don't work and are counter-productive. And every four years, that belief is disproven. These "character" issues end up mattering largely because Democrats, in election after election, allow wars over "character" to be waged in a largely one-sided fashion.